An essay on the changing trends of Christmas for Earthbeat aired as part of their “Preparing for the holidays” show. Christmas is mainly celebrated by 25 million Indian Christians – under 3 percent of the population. 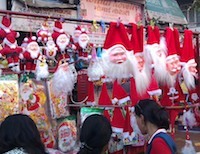 But in recent years, Christmas has become very popular across India’s religious spectrum. Earth Beat correspondent Chhavi Sachdev brings us this essay about how she’s seen Christmas change in the last 30 years. You can also listen to the full show, with stories on make-your-own-gifts; veganism during the holiday feasts; rental Christmas trees and more, by streaming or downloading Click here to open in a new window. In the media player, press play, or right click on the down arrow and save it to download and listen to it later.